We climbed the steps of the Drexel Daskalakis Recreation Center buzzing over the ease with which we had just passed through our first vehicle compliance checkpoint. It was our first time participating in a competition like this and none of us truly knew what to expect. As we made our way to the pool, students pulled their new SeaPerch T-shirts over their heads and high-fived and thumbs-upped with optimism. Once we found the pool and settled into a section of the bleachers, it was time for compliance checkpoint 2; the pool test. Two of the sixth graders gathered up our SeaPerch (Steve), our control box, and our battery and we headed down to the pool deck to find a judge. 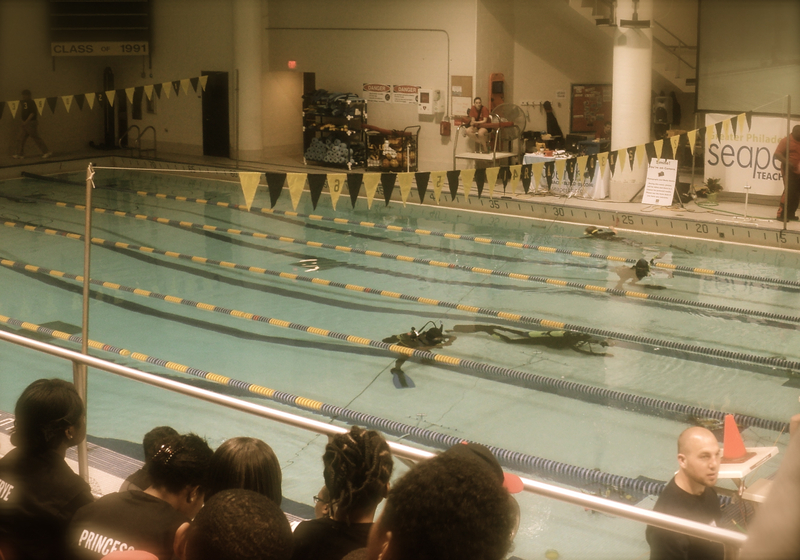 The kids placed the ROV in the water, and the judge asked them to demonstrate a right turn, left turn, forward movement, and backward movement. They did. Then he asked them to demonstrate whether the ROV could dive and resurface… it did, but then, almost immediately, it didn’t. We watched as our top propeller and shaft floated to the surface of the pool. Checkpoint 2… the pool test… first attempt… FAIL. Within 10 minutes, the kids had cleaned and sanded the motor shaft and re-epoxied the propeller shaft. Next… the waiting game. Although epoxy sets fairly quickly, directions recommend that it set for at least an hour before getting wet. We had twenty-five minutes. It would have to do. Meanwhile, opening ceremonies were about to begin. We filed up to the auditorium and found our seats. Since our first pool slot was scheduled at 10 AM, three of us snuck out a few minutes before the ceremony was over to retest and pass compliance. We found the judge and told him we were ready to try again. Our SeaPerch dove. It resurfaced. It went forward and backward. It turned left. It, it, it… it suddenly had a dead left motor. Checkpoint 2… the pool test… second attempt… FAIL. I’m not going to lie… for a moment my heart completely sank. The day before everything worked fine; now we were due to compete in less than 10 minutes and we had failed compliance twice. Weeks of work, help from volunteers, time coordinating schedules, trouble organizing buses, permission slips and contacting parents, finding lifeguards… all this excitement and effort, and now? What would I tell the kids? Or the parents who had shown up to support the team? Or the administrators who were counting on me to get students hooked on STEM activities?